I've been thinking a lot over the last few months about how I want to approach my memory keeping in 2015. I'm ready for a bit of an adjustment. I want something more loose and less structured (as in less emphasis on weekly) and from what I've been reading around the web that seems to be a bit of a trend. I'm ready for one album for my stories this year. One 12x12 album to hold pocket pages, traditional pages, and stuff of life (kids artwork, notes, etc). I don't literally mean that I'll force everything into ONE album because I might fill up one and need another, but I mean one home for all my stories this year. This one home will be a mix of pocket pages and traditional layouts in 12x12 and 8.5x11 and 6x8 and it will hold stories from 2015. Supplies will come from my Story and Stamp Kits™, from Studio Calico kits, and from other things I find here in my stash or from Scrapbook.com. This isn't new or revolutionary. People have been combining layouts and Project Life® style documentation since it's inception and I've been using divided page protectors mixed in with my traditional pages from time to time for many years. I think really what I'm ready for is something more organic and less structured and more focused on stories. I still love everyday life documentation - which has been my passion since I first started this adventure back in 2002. I still love capturing little and big things and I'm definitely not stopping any of it. But it's time for me to mix it up. This means I will not be committing to weekly Project Life® documentation in 2015. I'm up to date until June of 2014 and I plan to finish that as time permits (lots of photos already printed and "stuff" in pockets, but it needs some TLC). I anticipate that I will still do some specific weeks-at-a-glance like I've been doing the last few years, but it will be significantly looser than in the past (and include more of a mix of divided pockets when I do use them vs. always using Design A). I'm ready for that change. Just writing that out feels good. Does it mean I will never do weekly Project Life® again? Nope. My first Project Life® album was in 2010 and I've loved the process but I'm ready for the next evolution. And if none of this makes any sense, know that it's a work in progress and I'll be figuring it out as a go. The album begins with a divided 6x8 page protector from Becky Higgins (this is inside a black 12x12 We Are Memory Keepers album). "Hello Life 2015" is a new digital set now available in my shop. I cut it out with my Silhouette and vellum. I've got a tutorial here that shows you how to trace PNG files with the Silhouette software here. The big ampersand was from a previous Studio Calico kit (can't remember which one). I embossed it with black opaque embossing powder on both sides. Along the edge of the page protector I added a 2-inch Avery index tab and stamped 2015 using this awesome Pebbles rolling stamp. On the back side I added my favorite 2014 photo of the three of us. I'm just about done over-using it (taken during Week In The Life™ and used as my Christmas card). Note to self to take more group shots of the three of us. I like it so I'm going to use it. Again. The next pages is a 12x12 page protector from this variety pack that I cut to 6x12. "Give" in vellum was a left-over mistake from the end of my December Daily® album (the thread came out of the stitching). I decided to give it a home here as a nod to my One Little Word® for 2015 (I do have a separate album for documenting my experience with my word but I like having it included here as well). The "hello" label on top is actually on the outside of the page protector. The monthly paper and the floral 3x4 card are from the Park Avenue Studio Calico kits. The gold glitter remember card and the canvas 3x4 card are both from Heidi Swapp Project Life® kits (available via Michael's if I remember correctly). This was a 4x6 card that I cut down to 3x4. The letter stickers for "our" and the small word stickers are from my Firsts Story Kit™. It's a very simple beginning to what I hope will be an awesome mixture of long and short stories from 2015. Here's to stories and documentation and flexibility and evolution and giving myself permission to loosen up the way I'm documenting, holding, and sharing my stories. Thanks Ali, I'm feeling the same and I'm still undecided what to do. I love your idea. Personally I've found some of my 12x12 pocket pages have been breaking in the holes and I find my kids find them hard to flip through. I'm still not sure what I'm doing and its already week 2! But I do know I want to tell more stories, so here's to that! PS. I still smile when I see that photo of the 3 of you even if I've seen it a few times now! Oh gosh, it's a yes to giving yourself permission to change things up. There are so many rules in life already, putting hard and fast structure around creative experiences seems counter intuitive. If something's not working for you or feeling stale, change it up. I am glad someone is feeling the same as I am. I am ready for a change. I have only one son and he is at that stage where he doesn't want his picture taken. I can't wait to see what you are working on Ali! I've been doing exactly this since day 1, even though I admire what you've done with your PL albums I knew from the beginning I wouldn't keep up with a weekly approach and I wanted to include the kids drawings or a leaflet or whatever I always collect on my way. It was the best decision : I've got three years done (except for December 2014) and falling behind was never an issue. But you're talking about telling stories : I am still really bad at that. I'm looking forwards to seeing your next album. Thanks for sharing your plans. I look forward to see how the stories based approach goes and look forward to seeing your pages as always. Always looking for your inspiring ideas. I love the hybrid album idea. I have never stuck to literal week to week, more of what happened each month. I have wanted to get back to some traditional layout pages, but wasn't sure where to store them. This idea is great. A lot less pressure, a lot more fun! Looking forward to new challenges together. PS Ali, thank you for the beautiful print for DD. Not necessary at all, but very thoughtful. I did something very similar last year and loved it! I knew I wanted to make a 1 year album for my son (he's 9 months so I"m still working on it) and I didn't think I could keep up with PL while doing that so I did a combination of project life and different size pages. It was so fun and it totally worked for me. I'm a little behind but nothing I can't manage! Oh Ali Congratulations in "giving" yourself the push to make the change! I've been struggling with approaches for some time but i am such a fan of your work. I inherited approx 80 years (yes 80) of photos from my parents and grand-parents with tons of memorabilia and "stuff". Needless to say that I have boxes upon boxes of stuff to organize and of course my siblings left it to me to "document". I'm very overwhelmed right now but just trying to get organized and plow through in 2015. Thank you for your continued "growth" and giving us the courage to look beyond the "status quo" and embrace change! Wow, what an amazing (but potentially overwhelming) opportunity! That's one big project but I reckon if you take it step by step it'll be a really amazing journey, with a phenomenal result at the end. Not many people have the privilege of working on such a great project. I hope the excitement can outweigh the overwhelm. All the best! Good morning, I love your plan for documenting 2015. I am making changes to how I document our lives this year too (8.5x11, hybrid digital, monthly) So far I am working on my OLW, WITL and starting my 2015 this way and I am loving it. I quit my PL in July when it became too much to keep up with. If I have time I would like to go back to the beginning of 2014 and document it in this new format, but I'll have to see how much time I have and determine that later. It will be fun and exciting to see your stories and layouts this year! Happy 2015! Much prefer event memory keeping with some everyday highlights thrown into the mix. Some structure helps to stretch the skill set and add variety. I tell the story of the moment with your current products. Always created albums for my kids of their own lives. Start each school year with a new 8.5 x11 album, pocket pages and start dropping in those memory items. Fun to go back and see their growing up years. Looking forward to more inspiration for telling the stories that draw in the viewer. 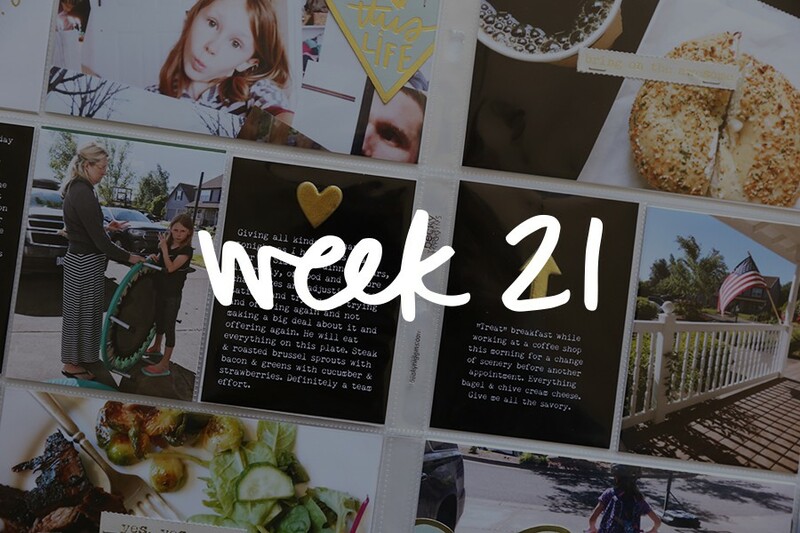 Thanks for the week in the life, December daily, and other photo + word exercises. Snap Ali! I am apparently following whatever trend that is and mixing up my Memory Keeping in 2015. 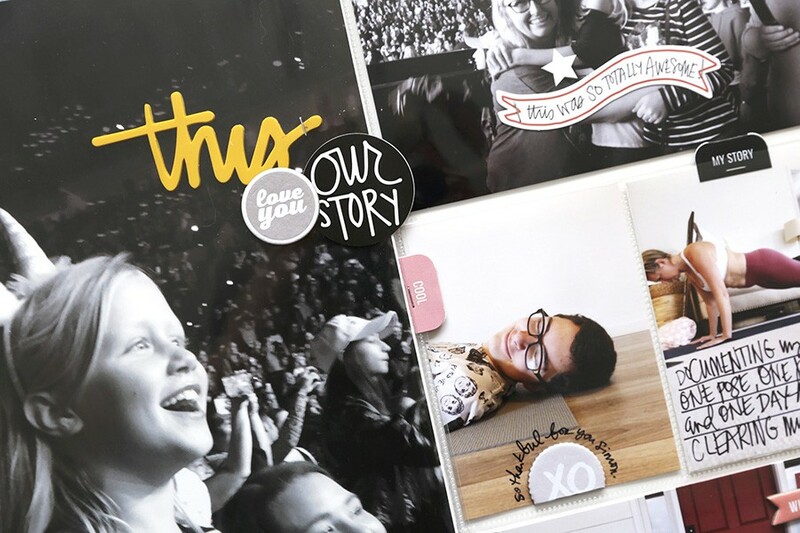 Not a huge fan of PL even though I have persevered for the past 3 years (not one of those years is complete), I am not a traditional 12x12 scrapbooker either BUT I have many many stories that I want to tell. Recent and not so recent all vying for a place to be documented. I have no set amount of albums in mind, I will just begin new ones as I need to. 2015 is my Year of the Story and being a subscriber to your Story Stamps and Story Kits I plan to fill many pages. And when I get stuck (as I am sure I will) I will look to you and your guests for inspiration! This is exactly what I started doing in 2014. I found it sort of tasking to have seperate albums for PL and Traditional and I felt like I wasn't always documenting a story in the way I wanted. Now my albums (I have 4 for 2014!) are full of both traditonal and pocket pages and they are so much fun to look at. Also, the addition of pocket pages allows me to get more photos in instead of usually having to pick just one or two for that particular story. Looking forward to seeing your album! I did the same thing in 2014, as it kept me from "duplicating" myself in both my project life and traditional albums like I did in previous years. I ended up with 5 albums, lol. But for 2015 I think I'm going opposite the trend and going to go back to seperate albums, with weekly PL focusing more on journaling each day...we'll see how long that lasts! I decided the exact same thing a few weeks ago! Life has been too busy the last few years (new baby, new fixer upper house, etc.) so a weekly PL is all I've done (and I'm SO grateful to have it all documented), but I'm ready to get back to actual pages with longer stories. So glad I'll have your inspiration to follow! I've been combining OLW and "Project Deb" for the last two years. I didn't have a desire to document each week but did want to keep track of the fun/interesting things I do thru the year. Looking forward to see your take on the same. Would you ever consider doing a silhouette cameo post? I am finally ready to buy one, but when I began to look them up online I can see there are a lot of additional things that you can buy, that I wouldn't necessarily need or want, so I am bit confused as to where to begin. (And also which one would really be the one I would "need.") I would love to use it for cutting your word art files. Any insight would be very much appreciated, as I don't know if I have to buy blades in addition to the cameo itself or what! Your use with that machine has inspired me to want one! Ali, you make everything so fun. I just love the way you include different sizes of pocket pages, sometimes by cutting them (I'm a huge fan of that now) in one album. Your creativity astounds me, inspires me, makes me happy. I look forward to watching as your album progresses. Pretty start! I just took advantage of a shutterfly deal to print out the rest of my 2014 PL pics, and I can't wait to wrap up. I simplified my approach last year, and think I'll try even harder to do one double page spread per month. Can't wait to see what your 2015 album will look like! I do this and I love it. 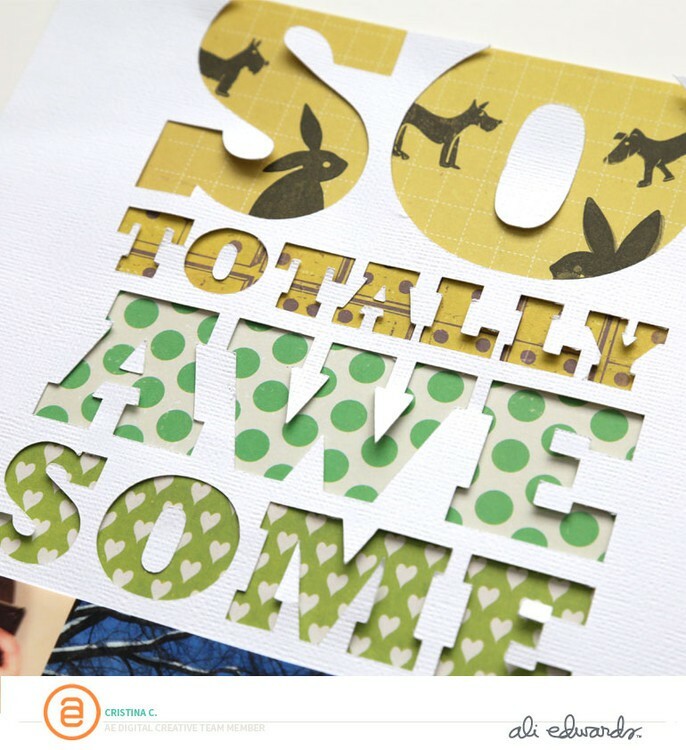 I love the mixed up sizes, it reminds me of a 'traditional scrapbook' you would see from years past. Just one place for everything. For 2014, I was more selective with which pictures to print and started making calendar month pages to fill in happenings that maybe didn't have a photo. I love the more simple approach, less organizing, and more time/space to truly make layouts. It is also part of the effort to focus more on stories. For big events, vacas, I tend to just do a separate mini album or a digi book of some sort, and I like that mix as well. In fact, I may be able to start 2015 in my 2014 album and that is good with me! Trying to have less 'stuff'!